Hatching and Raising Quail Organically for hay fever and eczema - Part 1 - Breaking down the cage door. | The Holistic Hen - How to raise quail, chickens and pigeons organically in a food forest Hatching and Raising Quail Organically for hay fever and eczema - Part 1 - Breaking down the cage door. 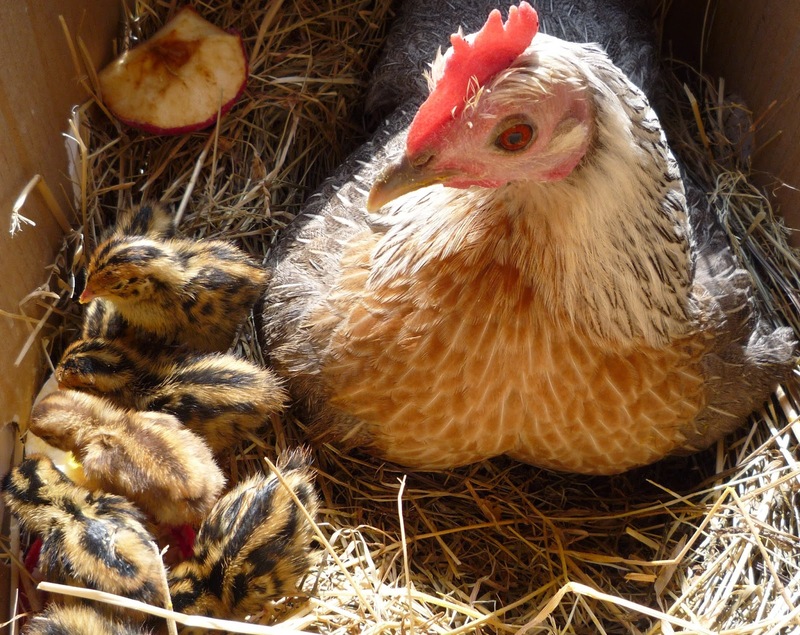 This is Polly, a rare-breed, organic Ardenner bantam and one of her brood of newly hatched quail. 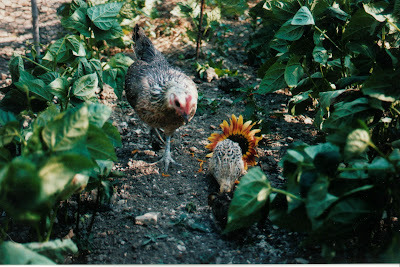 I first started raising quail when we came to live permanently in France some fourteen years ago now. My husband Andy had suffered from hay fever every year since the Summer of 1976. We knew that coming to live a new life in an abandoned field and orchard, would be untenable unless we found a cure. We had already began extensive plantings of so many shrubs, trees and flowers, for our eventual food forest. Furthermore, in 1977 Andy had also worked on a machine, using an oil which had caused him to have a contact dermatitis which led on to eczema. I had read that as early as the twelfth century in Japan quail eggs were being used in the treatment of various respiratory diseases and allergies. They were also used in traditional medicine in China. We couldn't find any organic eggs so I decided I would have to raise the quail myself. 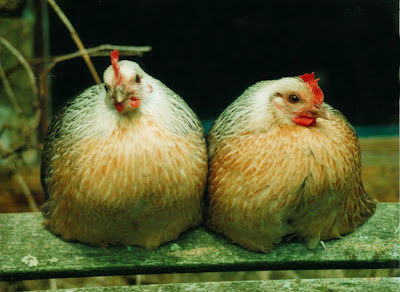 My first hens, a pair of Ardenner bantams called Chicklette and Pouldini, had been given to us in part payment for looking after a neighbouring smallholding whilst the owners went on holiday. Our Ardenners seemed ideal for the job, they were excellent mothers, foragers, they trusted us and they were very quick in everything they did, a great advantage with precocious quail. Whilst waiting to get my eggs I bought five quail from a livestock market in a nearby town. It was not initially a happy experience, the quail were totally neurotic when I bought them and equally so in the outside run we had made them. Luckily I had heeded the warnings and made a run with a soft voile top, as at the slightest noise they launched themselves up into the air. Over time however, they became accustomed to their environment, calmed down and began to lay. The one thing we used to love to do was to sit and watch them come out of their little house every morning with a hop-skip-jump and a beat of the wings, full of the joie de vivre. On visiting several places where they raised quail, I soon realised the key to their whole behaviour patterns. Everywhere we went quail were raised inside, on wire, mostly in artificial light and caged with hardly room to move. They were in effect laying machines, fed a high protein grain-based and sometimes medicated feed and with no greenery and certainly with no ghost of an attempt at their natural insectivore diet. The hatching of my first ever quail with Chicklette was rather traumatic. 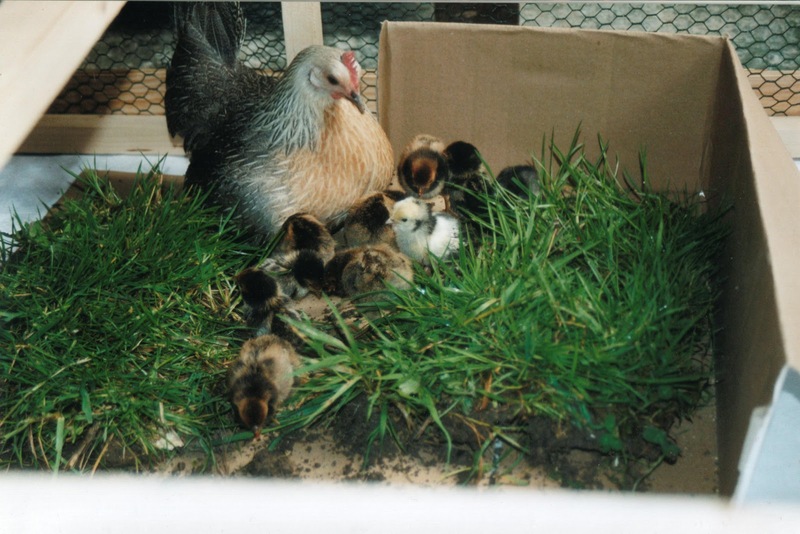 I had obtained eggs from two colours of quail 'Isabelle' or 'Gold', (see Granny above) and 'Range' a dark chocolate brown. Something I hadn't considered but which soon became apparent and was to affect the hatch, was that my Ardenner Mother had a total aversion to mice. In the main most hens love mice, to eat that is. I was right on hand when the quail started to hatch and we were probably more excited than the hen was. The problems started when Chicklette decided to take a good look at the babies, probably because they were making unusual (non-chick) noises and possibly because they smell different. Normally because she is at her most vulnerable, a Mother hen clamps down upon her chicks as they hatch, making encouraging noises in a low voice, something which would get no response with quail. It is true that some hens reach under and eat the shells as the chicks emerge and thereby remove the evidence of hatching which might attract predators. However, Chicklette took one look at these quail chicks and suddenly they were flying though the air and I could see she was only throwing out the chocolate coloured ones, which looked uncannily like mice. I gathered them all up and presented them individually, showing her that they were indeed baby birds, and happily she accepted them all back under her wings. This is Poulie with a hatch of Crested Polish Chicks, she too was a wonderful caring parent. If you are thinking of going ahead and raising quail always chose a Mother hen who has a good track record with raising chicks. Quail need a mother hen who has an excellent understanding of and is quick to notice changes in behaviour. Some mothers are very good at finding food but a quail 'mother' needs to be equally good at recognising the moment the quail need to go back under her for warmth and rest. She needs to stop foraging and 'sit', not all hens are good at this. Cold baby quail make a lot of strange almost whining noises, which can be very disconcerting, a good mother hen responds to this immediately. She will also be the first to notice any nutrient deficiencies, very common in quail from non-organic hatching eggs. If you see her pushing Baby back up on its feet, then be aware she has noticed it sitting down too long. This is the first sign of a Vitamin B and/or selenium deficiency and is very common in domesticated game birds and hence in their eggs. A good mother hen will be watching for this problem in baby chicks because it is one of the more common signs and in fact part of a natural remedy for coccidiosis, that is to keep the baby bird moving and expel the problem. Despite the initial trauma at hatching, Chicklette went on to form a strong bond with the quail, which allowed her to free-range them in the garden, doing sterling work amongst the bean rows. She stayed with them as their Mother for quite some time, longer than I had expected, I think the size of them fooled her into thinking they were still small chicks, who needed care. Having cured the hay fever and eczema what next? The symbiosis continues in the Garden. After eating those few eggs from our first quail, all those years ago, Andy never developed hay fever. In fact he never had hay fever ever again, nor interestingly enough eczema. Five years ago the nature of the active enzyme, the trypsin inhibitor which effects the cure was finally identified and pills made of quail eggs may now be purchased at organic stores. We certainly owe our quail a debt of gratitude. When my quail eggs hatched last March I had the luck to film the quail chicks as they emerged and I went on to document their first few days of life with Polly, daughter of Chicklette. In my next Quail Post I will take you through the joys and pitfalls of those first few days, culminating in the quail's first foray into the Greenhouse and the start of their full-time job in keeping down the greenfly, whitefly, black fly and any other nuisances they can help us with. Thanks for dropping by and if you have enjoyed this piece and found it useful think about sharing it and also may be about joining this blog. Please also feel free to ask questions or make comments in the section below. Taking you through the first few days. How your hen can bring out the best in baby quail. I have been searching and searching for information on how to raise quail more naturally and ethical. It does not seem to be popular. Thank you for this information!! How do you know if a hen is going to be a good momma? What should I look for? I'm new to the idea of quail so please forgive me if it's a silly question but why not let the quail mama raise quail babies? Thank you for sharing your experience. I feel the same way about how quail are raised and I hope to have some silkies raise them for me this year. Did you have any luck getting a quail to hatch and raise the babies? I'm interested in trying to breed that quality back into them. Hi John, you are very welcome. Re: quail, I raise coturnix japonica, I have never kept button quail, which have retained their monogamy and need to be kept in pairs. Ideally I would like my coturnix to pair off and get them to raise their own chicks which would be the easiest option!! I need however, to work on this and get the environment right, whilst making it safe from predators, I am still experimenting. In the meantime I have used several different breeds of mother hen. The Ardenner is a great breed for brooding quail but very rare outside Northern France and Belgium. My Sebright crosses too have made really good mothers for quail and last year I used a Frizzled Cochin, who was wonderful, in fact she has been in the greenhouse all Winter with them even though they are adults and they still get on really well together. You need a hen who is light-weight and also doesn't have heavy feathering hence the Cochin Frizzle - quail chicks burrow right down in the hens feathers. I have had problems with them getting feathers round their necks and then getting into trouble when the hen stands up. Temperament-wise you need a hen who is quick to notice changes in the chicks and is ready to accommodate to the different metabolism and behaviour of the quail in relation to that she would expect from her own chicks.. With regards to sprouting grain for chicks, you can feed them the grain you sprout for your hens as a good mother hen will break it up for them but even without that the grain is soft and easy for them to deal with. If you want to see the group of videos I made last year taking you step-by-step through brooding and hatching quail and the choosing of the mother hen then please visit http://www.youtube.com/user/Pavlovafowl where you will see I have a quail playlist. I will eventually get around to writing more detailed blogs on all these aspects of raising quail, so if you want to you can follow my blog to get updates - I am also carrying out some further sprouting experiments too and will be posting them also. On my youtube channel I do have films about broody hens, be aware that you perhaps need to get yourself one of the older breeds because if you have modern hybrids or commercial battery-type breeds they have had the broodiness bred out of them. I have 30 new quail chicks. I am still trying to decide what kind of cage to build - the rabbit hutch or a chicken tractor. One thing that I read is quail can get worms from being on the ground, and then they would have to be "wormed." Have you had any trouble with worms? Also, what type of food do you feed them that would make them "organic." Thanks! Just like the others... I too have been looking for information on raising quail and didn't like what I found.. I even thought I would just stick to my girls (chickens) and add a few more hens. I am so glad I found this video... I have a hen just like yours and thought about trying this but was told not too... I will definitely do it now and I cant wait.... What a fun adventure... my 6 year old son will be so happy and so will I. Thank you again! Hi there, You are very welcome! Thank you for your comments and I am so happy you are going to raise quail - the more the merrier, quail deserve so much better at human hands. My quail raising blog/vlog is on-going, so I have already posted quite a few more detailed articles on individual aspects of hatching and raising and I have many more to come. There are in fact, films I have made and posted to my youtube site https://www.youtube.com/user/Pavlovafowl but all these and more will eventually be written up here. People get really confused about quail because there is a plethora of 'cut and paste' articles, edited by people who have either never raised quail or only kept them in cages and which just, because these opinions are oft repeated, achieve the status of 'fact'. Your son will I'm sure adore raising quail because, one they are so super-cute and tiny and two they respond so well to care and attention and become very tame. On the more educational side, it will also be a great project, quail are intelligent birds and we can learn a great deal from them! The main thing and it will save you a lot of potential problems, is to get the best quality hatching eggs you can and if possible, to go and fetch them. In quail, nutritional deficiencies, passed from adult to egg to chick, show up really quickly because of the quail's speedy metabolic rate. Thus the better quality the egg the greater chance of hatching happy and healthy chicks, ready to hop, skip and jump as they never would in an incubator and cage. Quail eggs lose their hatchability quite quickly, so if you have to get them by mail then make sure you are guaranteed a speedy delivery. The optimum is to get organically raised fertile eggs, or if you can not get them, then those from a small producer who has non-caged quail on non-medicated feed. If possible, visit the people you intend to buy the eggs from and/or get recommendations from other customers. You might contact your local Chamber of Agriculture and/or Organic Farmers' Association and find out if there are any organic quail farms in your area. If you get a moment watch some of my more recent films, which take you through a complete hatch from choosing a mother hen to hatching, bonding, feeding, foraging and free-ranging, as I say they will be written up here eventually! Hi aline, Thanks for your kind comments. I speak French so if you need any further information you have the choice of either language! I have more of my 'quail diaries' in film form on my youtube channel, which are not written up here yet but will be as soon as I can sit down and get them on here. So many people have been persuaded that quail can and should be stuffed into small cages with artificial light and a total grain diet, sometimes with added medication. My neighbour told me recently that the life expectancy for domesticated quail in France is 6 months!. All the very best from sunny Normandie, Sue. what happens to the quail? Thank you for this wonderful site! I haven't gotten any actual work done in 30 minutes, reading up again on quail. I am thinking of hatching a dozen quail with my four year old next spring. We live in a suburban area with a small yard. That said, we have two organic gardens (one at home and one at the community garden). My son has been able to tell when to pick a ripe blueberry or cherry tomato since he was 11 months old (totally unnecessary bragging here. I'm just a proud mamma hen. :) ) Anyways.... back to the coturnix. We aren't allowed chickens here. I have checked. but, quail are a different matter. Ive been doing some intense research on backyard quail keeping, and even the experienced writers only refer to the rabbit hutch like enclosure for the backyard enthusiast. I just cannot think that that is what is best for them. I don't have much space at all but I want to build something where they can forage. so I have some questions: 1) these little hatchlings will not have the benefits of a mamma hen to show them how to forage. I assume they will learn any how? 2) Would you still put them out in a run without the mamma hen and if so, at what age? 3) what sort of enclosure do they live in after they reach mature laying age? 4) what do you keep at the bottom of the enclosure. 5) Do you move the enclosure around like a tractor or is it OK to keep it in one spot? 6) what did you remedy about their housing after the predator attack. We may be in a suburban environment, but we still have fox, raccoons, oppossums and of course, rats. thanks so much in advance and again, thank you for the wonderful site. Hi shauna and thanks for your great comments! I was thinking maybe it would be best to answer your questions in an article on the blog, as you raise so many interesting points. However, as I have not yet had the chance to get around to this, having so much backlog piling up over the Summer, I'm replying directly to you. Firstly, have you any chance of a social garden, where you could keep chickens or at least a couple of bantams to bring up your quail? It is just, I think quail chicks stand a better chance of success with a mamma. However, do not despair because you can do this on your own but it will mean being very attentive to temperature. It is this more than anything else that is important, as quail chicks will die purely from being too cold or even too hot. For hen chicks I'm usually looking at an outside temperature of 16 deg C around 60 deg F but this is with a mother hen. Quail chicks need it warmer and you need to cut down on any wind chill factor, so maybe take a look at my run in my most recent article, which is entitled 'Late Hatches of Chicks - Coping with Chickens in Cold Weather - Tips and Strategies 1'. You will find a photo of my set up run for quail. I have never kept quail chicks without a mother hen but recommendations for brooder temperatures at around 90 deg F in the first few days seem to be the norm. You would need to read up on this as it is crucial and it takes some time for quail to regulate their body temperature and weeks for them to become fully feathered. Therefore, if you live in area where there are wild quail, plan on brooding them around the same periods, although remembering that for their first few days the wild quail will have the option to be under their mother! Quail are precocial so they should be out foraging pretty quickly when in the wild but your outside temperatures will need to be the same as if they were in a brooder! (...cont) My idea would be for you to start with adult quail and get the environment conducive to them sitting their own eggs and raising their own chicks. This way you will get a lot less stress!! 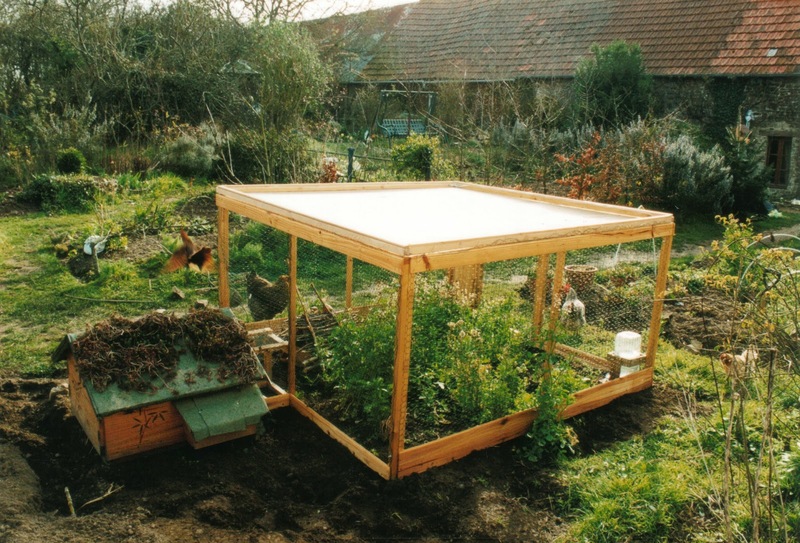 One of the ways to make sure they get a good varied wild diet and an illusion of space, if you haven't got room for a largish run like my greenhouse, which is 3m by 5m, is to have a type of chicken tractor which will fit over your garden beds, the quail will then be doing the weeding and pest control at the same time. This only works though in shrub type borders, as quail will eat a variety of greenery including tough leaves like Summer Squash, which hens won't touch. With a larger space you can keep them in there all the time as long as you are regularly moving the soil, i.e. adding compost and cultivating plants, for example this year I have had my quail amongst my tomatoes, although I had to protect them when small as they will eat the leaves! You will also need an area, which is predator safe for them to breed in, I am doing this with under-wired 'nest boxes' basically false wood piles, with a triangular inner structure where they can nest and which I can shut at night. The rest of my quail that are not sitting get put away in an under-wired house. I have soil as my greenhouse floors and I am chancing it rather as my quail sat eggs this year out in the open greenhouse at night. Ideally with such large predators as you have and who can dig well, you might think of a layer of wire under the whole run and then soil and planting on top. You can always, once your quail are tame put them out in wired- over beds during the day when you are around or even free-range them whilst you are out gardening if you feel comfortable with that. Do you raise any of the quail for meat? We are thinking about getting some adults to start from and then hatching out babies for multipurpose. I am wanting to use them for eggs and meat. I love thecae of letting them on the ground, (clearly it makes more sense). I also had read about the worming issues but we never had worms with our free roaming chickens, so I think you must have the right idea with diet. DO your lay in the same spot or do you find eggs everywhere? Thank you very much. Hello - really hope your blog is still active - it's a great site! We have a few Coturnix quail in a large fenced orchard/vineyard in southern Tasmania (Australia) and really need advice on why our females are weakening and dying a few weeks after hatching and raising chicks. We've had two girls go broody, sit on their eggs, hatch their chicks, and when the chicks are only two weeks old the mothers start to be really tired, stop eating, and slowly die. It's very distressing to see, and we hate losing our beloved girls. They are relatively young - only a year old. Can you help?? Thanks! Hi Chloe, I have a few ideas. Off the top of my head and having kept both hen chicks and quail chicks, I would say your mothers are perhaps sacrificing their food intake for the babies. Quail chicks in particular are very demanding, they have a higher metabolic rate than chickens and much shorter times between feeding and sleeping. This is why I always stress that if you are raising them with a mother hen you need a very adaptable and speedy hen who is able to keep up, also however one that is able to take care of herself, hence the Ardenner for example. Quail chicks also achieve adulthood very quickly, so again those first few weeks are a lot more demanding in the sense of speed of growth. The only time I have lost a hen with hen chicks was when she was in the moult and although this was in Spring and foraged food was abundant, she put on a complete set of new feathers, raised her chicks to a couple of months and then when they were ready to leave, literally keeled over with a heart attack. So the first thing I would ask is, are your adult quail in moult and/or is there enough food to go round because a mother will, in my experience always give to the chicks first and particularly in those first weeks. With quail chicks being supposedly precocial, at least in the wild, the mother would then be expecting them to start looking for their own food after this time but may not be strong enough to survive that long. One of the most important amino acids for feathering, physical and nervous system growth is methionine, available in abundance from invertebrates. I would therefore be looking at providing easy access to a compost bin or getting an invertebrate 'farm' going to provide an abundance of this, in order to take the onus of the mother to find it. I would also look at adding a daily hard boiled chicken's egg (fed in two halves am and pm) to each brood (including both mother and chicks) and make sure you see the mother eating it. Egg is an excellent all round food and provides almost all of the B complex vitamins so necessary for physical and nervous system health. You could check my films on riboflavin and thiamine deficiency - the riboflavin one is already written up here. If you go back to my blog contents page (direct live link 'Return to Contents Page' at the end of the article above), you will find it under the heading 'Quail'. My thiamine deficiency experience is just at the moment only in film form and on my Pavlovafowl Youtube channel - live link on this blog page - above top right-hand column. Once on my channel, scroll down to the heading 'Quail diaries - Raising Organic Quail - 21 videos' press that and it will bring up the whole playlist, Thiamine deficiency is number 19. Thiamine deficiency can be devastating in quail, the onset is slow and can be missed unlike riboflavin and they actually lose the ability to remember how to eat and just to make things worse, it affects vision too! Another B complex vitamin deficiency I would be looking at would be B9 folate from green leafy vegetables, needed in its own right but also to work in synergy with the 'DNA heavy hitter' B12 cobalamin from the invertebrate protein. ...cont The other problem I can think of, is that the quail are not getting off their nests for long enough periods to eat sufficiently whilst sitting the eggs. I watched mine to make sure. Do you think this is a possibility and if so, could there be something causing it such as fear of predators or another bird taking over the eggs. This is of particular interest to me in my present research into quail in a natural quasi-wild environment. If you have read any of my recent posts on quail going broody and sitting, you will see that I postulate the idea that the male may have a role in sitting and/or brooding. Perhaps centuries of quail farming has bred that behaviour out and maybe the initial energy requirement to look after the chicks is too great for a mother who needs the father to be sitting and brooding too. There is so much to learn and a paucity of written research material. I wonder if you have thoughts on this? There is also the problem, again I have observed this in a few hens and had to remedy it, that the hen is so intent on sitting that she becomes obsessed and will hardly ever get off the nest albeit the eggs are not at risk. Thus if this is happening in your case, either by fear of something happening to the eggs or the obsession of a new mother keen to sit, then she will be having demanding chicks hatch when she is at a low ebb due to insufficient diet due to a low volume of food intake. Hope I have given you some ideas as to what maybe happening. I am presuming it is only the mother that is affected or are you losing the chicks too? If they are then I can think of another possibility, what about lead arsenate poisoning? This is a problem throughout the World where poultry is kept in old orchards, once lavishly sprayed and for centuries with this cheap home-made coddling moth insecticide. These toxins do not degrade but remains in the top 20cms of the soil just at a level to be dug up by a mother scratching for food for her chicks. The stuff about toxins is interesting as we know the fellow who owned the orchard and vines before us sprayed the weeds a lot, but we think the other quails would be affected if this was the case. With our other broody girls we locked our male away because he kept driving them off the nest, but with this one we have kept him out - there are other quails around to keep him distracted and maybe he'll help protect her chicks if and when they hatch. Thanks for your wonderful blog and please post more pictures of your quails! I am 16, and my dad is French - he comes from a small town near Nyons, in the south. My mum is Australian and we live in Tasmania. We have only had our quail for 10 months but we love them and love learning about them. Hi Chloe, I am so happy to have been of help. Unfortunately you can't find out about these things until they happen. As we enable our poultry to behave in a more instinctive manner by providing them with a natural environment these things will and do come up. It's as if their instincts come back to them but not all at once, they seem to 'remember' certain things but not all. The nurturing of young seems really the strongest thing to emerge, which I guess is normal. I have hens, who will look after chicks for six months, in fact one hen would meet her 'chicks' over a year later in the garden and still be offering them food. There is a symbolic wood carving we have here in Europe and maybe it is over the world, it is used as an allegory of Charity in many churches but is in fact a much earlier legend, which religion later adopted. It shows the mother pelican feeding her starving chicks with her own blood, it represents a time of famine and in some versions of the legend the mother's life is forfeit because she weakens herself in so doing. I'm guessing it was taken from Nature, something someone saw and used. Our problem is no one is doing this sort of research, as I wrote, I'm still trying to find out about if the male coturnix quail should be helping to sit eggs and rear chicks Certainly there has been research done on some aspects because there are two university studies to my knowledge but nothing conclusive. However, encouraging the male quail to remember his potential role in looking after the chicks would go some way to solving the problem of overworked mother quail! You are doing a great job and I do hope you are keeping notes and writing this up and/or filming it. I am particularly interested in your set up, you say it is an enclosed orchard and vineyard, do you have it netted over with game netting or are you predator free? My problem now is neighbours' cats and birds of prey, so my free-ranging quail all have to be supervised when out and about. This is why I am creating quasi-wild areas but within a large greenhouse so they are particularly safe at night when they are nesting. My main trouble in the past has also been rats, luckily this was no longer an issue when my neighbour stopped fattening up meat birds with unlimited grain. 30 rats were seen on her lawn during the day, which usually means there is a big colony. Once she had grown her fowl and sent them off, the rats, being highly intelligent, spread out to look for food elsewhere and I lost 12 quail in one season. I do not know Nyons but we have been to the Drôme several times, it is a very beautiful region. We visited Die which is not far from Nyons on our way to Pisa some years ago, they make a superb sparkling wine which we have every year at Christmas to celebrate and also remember a great holiday. If you haven't already, I hope you get to visit your Dad's native land. Thanks again for answering! Our orchard is fully netted with bird netting with extra chicken wire down the bottom because we had an awful time with rats chewing holes and eating our eggs and the small quails... We also had one quail killed by a sparrow hawk through the net, and our neighbours cats constantly prowl around but they haven't got in so far! the latest update is that two of our girls seem to have the "curled foot" issue that you talked about your chicks getting in one of your videos, one of our girls is very old and doesn't forage much, and the other is on her nest and only eats what we feed her. They've both been limping badly,and they're not getting enough nutrients. We have been feeding them extra mealworms and vitamins in their drinking water and they've been recovering quite fast (we have only been doing this for a few days). Thank you for your videos, have you heard of adult birds getting this deficiency? Hi Chloe, You are welcome. Predators are terrible with quail and rats are some of the worst, they are so quick, clever and resourceful. Yes I've had the sparrow hawk problem too but mostly with my fantail pigeons. The thing I found with birds of prey is, they really like an easy life. I once knocked a sparrow hawk off the roof by throwing an apple at it, it was so annoyed it never came back! Yes that's a classic riboflavin deficiency and foods rich in B2 will start to remedy the condition within hours and a complete cure will only take 24 to 48 hours. I also mention selenium in the article and film and I've always found this is very important too. That is the amazing thing about quail because of their fast basal metabolism they show so well how getting the right diet is key. Yes I've had deficiencies occur in adult quail, particularly when I've purchased them. They've come from a caged environment and hardly moved all day and then they get here and can run around and fly. So they can quickly use up their store of nutrients as they may not always be quick enough to adapt to catching invertebrates and foraging. I noticed with the ones I bought a couple of years back, the first thing they did was consume a great deal of earth, so I'm guessing they were short of minerals as well and perhaps small stones for their gizzards, which would impact on their ability to digest their food. In a similar way your nesting quail and older quail can get nutrient deficient by not eating as well as they have been in the past. Helping them along is a great idea. I learned so much about B complex vitamins from quail and the severe health problems caused just by deficiency of tiny amounts of these crucial compounds. Quail also get stressed badly when they don't eat properly and the stress causes further deficiency so it is a vicious circle but knowing that, you can also remedy it easily. When we go away on holiday my adult quail can get stressed because they don't get the same choices of food and obviously they know the people who feed and put them away are different. When I come back I often see the emerging signs of nervousness and stress build-up so, the first thing I do is get them a good feed of invertebrates from the compost heap. Usually within a couple of days they are back to their old selves. I have been interested in raising japanese quail for awhile but had been told and had come to believe that they could not be raised in the exact manor that you are raising them. I'm thankful for your YouTube videos they have been extremely helpful. I plan on doing more research but you have definitely opened up a new avenue that I thought was closed. This is Chloe again - I just wanted to let you know that my family have set up a new blog describing some of our experiences with our quails - you have inspired us! We are new to blogging so it doesn't have a lot at the moment but we thought it might be a good way to keep track of all the things that happen when you have quail! Our latest news is that one of our girls went broody, sat and hatched eight chicks from eight eggs (a record for us!) and is now busily raising her babies with the help of her daughter from an earlier hatching. The two are literally co-parenting - they both keep the chicks warm at night (four under each) and feed them during the day. This is despite the younger girl never having mated, or laid eggs. It's incredible to see. The alternative is to use an artificial incubator to hatch the eggs, which attempt to replicate the environmental conditions that the egg would be subject to under a hen by controlling the temperature and relative humidity within. They come in various types: still air or forced air, where the latter uses fans to circulate the air within the incubator, and automatic or manual. Hire eating quail eggs for allergies. Do you boil or cook them or have to eat them raw? Wow, the hens and the chicks are both cute! I want to raise up some of them, hmm, thanks for your sharing. Wow, hatching and raising chicks is really interesting, I think so. And your chicks, they look really lovely. I haven't hatched or raised chicks before, but now I'm taking it into consideration. Thank you for sharing. Your garden looks great and thanks for all the information. My quail pen is sort of similar to the one you are showing on this page, had to quickly put it together when i got some quail. Unfortunately it doesn't look as lush underneath it as yours. My quail seem to be quite effective in killing off anything green in there I have 5 on 1.5x1.5 meter. My quail seem happy, especially the one rooster who seems to divide his time by eating and jumping the 4 hens. Sadly this is quite visible by the feather loss on their heads. Maybe I have to separate him for a while (in the same cage though). Hi ed, you are very welcome and thanks for taking the time to comment, I appreciate it. Quail eat a lot of vegetation and they also eat roots, I actually use them for weeding and I have to keep adding greenery all the time. I also have another greenhouse where I can move them to, so it gives time for the one area to regenerate. I am also experimenting with growing meadow grasses in wooden seed trays so I can let them graze so far and then give the grass time to grow back. Sadly when quail were first taken out of the wild it was not to provide eggs but it was the males and they were used in cockfighting, so they would obviously pick the most belligerent. I think therefore, that a lot of male quail still retain that fostered aggressive streak. However, many people I have corresponded with have found, like I did, that quail will actually pair off and form monogamous relationships and then the male becomes much calmer. He will then actively engage in the nesting process and guard the nest. I think also it was part of my quail's learning process to be raised by a mother hen, as I am absolutely certain the hen helped to bring out their natural sitting and brooding instincts. Give them time they are still young and naturally bred quail mature much more slowly than those in cages. Is your male calling yet because it is the call that starts the females nesting. I would also up their invertebrate protein, as again that is a signal there is plenty of quality protein about and it could be a good time to raise chicks! Hope this helps! tnx. Currently he keeps jumping all 4 hens and yes he is calling. I see some initial signs of brooding but after a while the hens give up. So till then I just try an incubator. Will add a seperate detacheble containment to my cage, to lure them in so it is easier for me to move the cage to another plantbed. Just one more remark.. I got the quails for eggs and eventually for meat, but they are such lovely birds that I will probably not end up killing them. I know, cows and lambs are lovely too. Well with only 5 ofcourse I am a long way from eating them but I think I changed my focus to the eggs. That should be enough for my protein intake. .. no I really don't figure on eating them, I get too attached to them and they've all got names and that is a real no no for eating something! Naturally and organically raised quail eggs are high quality and therapeutic proteins so I would think you would have a good item of barter there if you wanted to swap with another organic breeder for say meat birds you hadn't raised. The other thing of course is to raise fish but my guess is that raising anything carefully and with a lot of love makes it pretty difficult to then imagine it on a plate. My sister has just started with rabbits and her kids are already saying that no way will they ever eat them. This is why I buy any meat we eat from our local organic butcher and he has a mission statement on the shop door and I even know the farmers who he buys from, most of the meat is local, except for the luxury items like Parma Ham, I buy the 'heel' that no one wants for a knock-down price and use it in so many recipes. Although originally planned, I dont think i will end up eating any. As a matter of fact I raise fish as well for that purpose... and still havent eaten any. It is not out of hypocrisie, as I understand animals are killed for food, but it is as you say indeed a bit harder when you know them personally. I just wanted to add my own appreciation for your blog and your bravery reminding folks of humane, responsible quail raising. I am embarking on my own quail adventure, as an alternative to our previous backyard chickens, for the noise factor and the torn-up-yard factor. This spring, I built five 5'X5' raised beds specifically for quail use. Three are currently loaded with vegetable plants, while the other two have served as compost areas for yard-clippings and kitchen wastes. I'm constructing a moveable enclosure that locks down on theses beds, and a nestbox on a wagon, to be moved to whichever bed has the enclosure. 1. I have read in multiple places that quail "lay as they may", and I am worried a bit about collecting eggs from under plants or other difficult to reach places. Has this claim borne out in your experience? 2. Because these raised beds are still only 8" off the ground, I am concerned about how the quail may respond to our family dog. I think with some patient training, he will not bother them or the enclosure (our chickens free-ranged, and we were able to teach him to have no interest in them). But these are a much smaller bird, closer to what dogs have been bred to go after (he is a shelter-rescued terrier). But I am more concerned about whether the quail would ever get used to his presence. Would you advise some sort of visual screen another 12" or so up the sides of the enclosure? Or do you not really see this as an issue? Hi Jeremy, Thank you so much for your kind comments they are very much appreciated. Firstly, the more natural you make the quail environment and the more invertebrate protein you can get into them, the more likely they will become more natural in their behaviours, including creating dedicated nesting sites. In my experience food and environment are so important for quail, as indeed they are for all living creatures but with their high basal metabolism, quail seem to me to be the epitome of what nutrition and style of living can achieve. Therefore, I am suggesting that when you put your quail in their planted environment, they will start to nest in a chosen dedicated area. You will however need a male quail to achieve this, as although there are few academic studies on this subject, the ones I have read confirm my observations that it is the male's song that encourages the female to begin nesting. In my experience he also guards the nest site - so that will be a good indication too! My quail often choose to nest in the enclosed box they sleep in at night and you could also make a dedicated area within the run, a clump of grasses for example, which would look inviting as a potential nesting site. Re your dog:- only you will know the answer to this. I do have a little experience with terriers and they are hunters but not in the sense of hunting/pointers/gun dogs, which can be trained to resist their natural urges. In fact, here in France these dogs, albeit illegally, are trained to leave quail alone by using live quail, weighed down so they can not fly when left in an open field! Again quail like dogs are individuals and again good food acts on the nervous system, my new quail chicks when they were left by their mother after 3 to 4 weeks went down to the bottom greenhouse which was near to the road and made no sign of worrying about the occasional tourist traffic noises. So your quail may take no notice of the dog or they may be 'freaked out'. Certainly the more methionine and B complex vitamins you can get into them (I'm presuming you may not be able to find and purchase organic quail and even so they may have been on a grain-based diet) the better they can handle the temporary stress of a new factor in their environment. It would really be the dog I would be worried about. Just off the top of my head, a rescue dog may have had a difficult emotional life and any new creature which claims your attention and to which you show affection, may be a cause for anxiety to the dog and thus a trigger for conflict. I do have experience of this, in that many years ago I sold three birds (chickens and a rooster) to a friend, who told me a fox was taking them until she caught her Collie with the final one. She doted on the hens and her dog had become intensely jealous. To contradict this, however, you have already trained your dog with your hens, so again only you will be able to judge. I just think 'holistic' every time and usually by taking everything into account, particularly personalities, I can find solutions. Try experimenting in a controlled environment where you can intervene quickly if anything goes wrong and then try again, observation is everything and birds change, as do dogs. So yes I see it as an issue but an issue that depends on many factors which may be overcome and/or the situation itself may change. Hi, how are you? i am wanting to get Japanese quails (cornex quails) that will brood and sit on their eggs. if i get very young ones and raise them would they go brood? i live in a small unit and my backyard space isn't that big for chickens but great for quails. i had cornex quails before and they didn't go brood. will it make a difference if i get 3 females from one place and the male from another just so they aren't same blood? toking forward to your response.